When photographer Nan Goldin appeared on the art scene in the late 1970s, her tough, autobiographical frankness quickly established her in the all-male field of diaristic photographers. The beaten down and beaten up personages that populate Goldin’s work are icons now deeply inscribed in our collective memory. 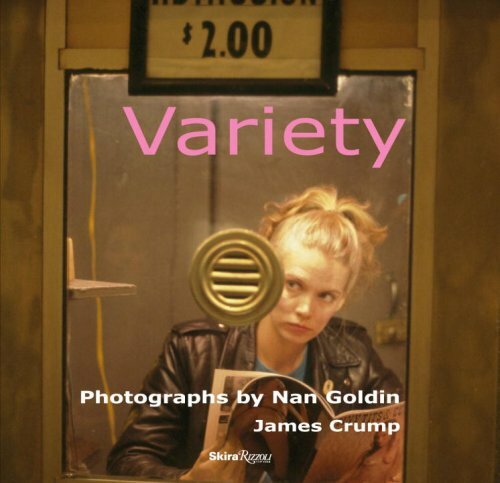 Variety: Photographs by Nan Goldin compiles the still photographs Goldin created for director Bette Gordon’s now-infamous 1983 independent film, Variety, and offers a rare glimpse into this artist’s symbiotic working process. Hallmarks of Goldin’s early work and the influence of filmmaking on Goldin’s prolific career are on display in this project. Hovering unsettlingly between fiction and reality, 'documentary style' and art photography, Variety: Photographs by Nan Goldin reveals a curious and previously unexamined aspect of Goldin’s iconic career, and provides a window into the collision of music, club life, and art production that colored the Lower East Side of Manhattan. This is an important addition to Nan Goldin’s oeuvre.